The Politics of Smoking - Learn the latest on Virginia and national political issues regarding cigar and pipe smoking. Please note that any information provided below is done so as a courtesy to Milan Tobacconists' customers and does not necessarily reflect the views or opinions of Milan staff. Give us a call toll free at 877.70MILAN or send an email to customercare@milantobacco.com if you have questions, concerns, or comments! Momentum is growing for the need to address FDA regulations relative to premium cigars and your voice is needed right now. Congresswoman Kathy Castor (D-FL) recently introduced a bill "To amend the Federal Food, Drug, and Cosmetic Act to clarify the Food and Drug Administration's jurisdiction over certain tobacco products, and to protect jobs and small businesses involved in the sale, manufacturing, and distribution of traditional and premium cigars" (H.R. 1854) along with 30 bipartisan original co-sponsors. This comes shortly after Senator Marco Rubio introduced S. 9, which would also grant a premium cigar exemption. Thousands of you joined us and wrote to your Senators urging them to support S.9 and we need to advocate once again. Please take a few moments to contact your Representative to urge them to support H.R. 1854. The House of Representatives needs to hear from both retailers and enthusiasts to demonstrate broad support for premium cigars. The House Energy & Commerce Committee is considering this legislation and it is even more important for people in committee members' districts to contact their lawmaker. Thank you in advance for all that you do to support premium cigars. -> Take Action! Courtesy of the IPCPR of which Milan Tobacconists is a member. To learn more about the IPCPR, please visit www.ipcpr.org. The FDA today delayed a November 8, 2019, deadline for reporting the results of testing for harmful and potentially harmful constituents in every cigar and pipe tobacco product sold in the United States. This was a huge problem because the technology for testing premium cigars does not exist, and the FDA had provided no rule saying how it was supposed to be accomplished for cigars and pipe tobacco. The new deadline is now six months for large manufacturers, and nine months for small manufacturers, after the FDA releases guidance on how the testing should occur. There is no indication that such guidance will be released during 2019, although we will keep members abreast of developments. The FDA's delay of the testing reporting deadline follows several presentations to the United States District Court for the District of Columbia on behalf of IPCPR and CRA on the unfairness of requiring testing and reporting to occur in the absence of guidance and rules defining the process. The FDA acted in advance of a Monday, March 11 deadline, by which IPCPR and CRA had promised to move for an injunction against the November 8, 2019 deadline if FDA had not delayed it. CRA executive director Glynn Loope stated, "Today's significant action by the FDA in extending the deadline for HPHC reporting, for the time being, removes a cloud lingering over the premium cigar industry. It is a testament to the efforts of our CRA and IPCPR litigation team for reaching this agreement." CRA and IPCPR will continue to engage with the courts and the FDA regarding the HPHC reporting requirement and deadlines and regarding next steps in the litigation process. The above press release is courtesy of CRA of which Milan Tobacconists is a member. To learn more about the CRA, please visit www.cigarrights.org. Join the thousands who have already taken action and reach out to your Senators today to either thank them or request their support of the Traditional Cigar Manufacturing and Small Business Jobs Preservation Act of 2019 (S.9) introduced by Senator Marco Rubio [R-FL]. The bill is crucial to the fight for our industry, small business retailers like Milan Tobacconists across the country, and enthusiasts. The bill defines premium cigars for the federal government and exempts them from the current onerous FDA regulations. Make your voice heard and contact your Senators today! -> Take Action! Just enter your information and a message to your Senators will be sent based on their support as a co-sponsor of S.9 or lack of support, in which case they will receive a message urging them to support the bill. Today, Cigar Rights of America issued a letter to each of the nation's governors alerting them to the state impact of federal regulation of premium handmade cigars. Given the potential consequences of these regulations on production and consumption as well as the direct ability to shut down small businesses across the country, CRA felt compelled to alert the governors of the fiscal impact on state OTP tax collections and the potential for job losses and business closures in their states. The letter implores the governors to encourage their state congressional delegation to support legislative efforts to protect the industry. The letter was also distributed to the National Governors Association and the National Conference of State Legislatures. Glynn Loope, executive director of CRA stated, "This is another classic example of federal regulations adversely affecting the states." Loope continued, "We felt it necessary, in light of where we are in the regulatory process and in our effort to mitigate the harm these regulations can cause, to bring this to the attention of the nation's governors." Premium Cigars are an artistic craft enjoyed by millions of Americans each year. However, FDA regulations threaten to make this unique hobby and the life blood of thousands of small businesses...go up in smoke. Congress has a chance to fix this problem - but they need to hear from you today. Please take a moment to contact your elected officials to save premium cigars and the small businesses [like Milan Tobacconists] that make up this industry -> Take Action! Tell them to support the Cole-Bishop language in the FY 2019 House Agricultural Appropriations Bill (H.R. 5961), which would exempt premium cigars from the one-size-fits none FDA regulations. After you send a letter to Congress, you'll have the ability to post the link on social media and email it to fellow cigar enthusiasts. We need everyone to do their part to save our industry. Support your community, support your cigar stores, and let your voice be heard. Yesterday, the International Premium Cigar and Pipe Retailers Association ("IPCPR") and Cigar Rights of America ("CRA") filed a joint comment in response to the U.S. Food and Drug Administration's ongoing review of how it should define and treat premium cigars. This process, known as an Advanced Notice of Proposed Rulemaking - marked a major milestone for premium cigar retailers, manufacturers, consumers and the industry at large. It was an opportunity for IPCPR, CRA and other stakeholders in the industry to provide another evidentiary based justification for why premium cigars should be regulated differently from the direction the agency has thus far taken. Premium cigars are not used by consumers as an alternative or supplemental source of nicotine. This data, published since cigar regulations went into effect in August 2016, counters the FDA's justification for applying burdensome new requirements on the industry. Scott Pearce, IPCPR Executive Director, recognizes these comments are a definitive step in the continued fight for recognition by the Federal Government. "These comments represent everything that is great about both IPCPR and the premium cigar industry. They underscore the craft of premium cigars, the importance of the brick and mortar storefronts to local economies across the country, and the makeup of consumers who enjoy the products. If heeded, these will help ensure a free and fair environment for our retailers to flourish in and continue the great cigar (and pipe tobacco) culture." CRA Executive Director Glynn Loope stated, "The Final Rule as issued by the previous administration was a solution in search of a problem. The studies and comments filed by the premium cigar industry last night provide substantive answers to the FDA solicitation for comment, with analysis and recommendations for relief from rules that 289 current and former members of the U.S. House of Representatives, twenty-six current and former members of the U.S. Senate have stated are burdensome, unfair, and go beyond congressional intent. Now, we can add a federal judge that has noted how unjustly the industry has been treated. Now is the time to correct this case study in bureaucratic overreach." With the comment period now closed, it is now up to the FDA and the Trump Administration to take the unassailable science and proposed definition provided by the industry and make the right decision. Change the structure of the Deeming Rule, define and exempt premium cigars and finally bring economic relief and a sense of certainty and security to thousands of small businesses and tens of thousands of Americans across the country. Ken P. Neumann, President of the IPCPR Board of Directors, is hopeful. "One thing we have seen with this administration time and time again is a willingness to look at the regulatory status quo it inherited and say 'I don't think so.'" While there is no required timeline or next steps for the FDA or the Trump Administration, IPCPR, CRA and the rest of the industry will continue to engage on Capitol Hill and in the Executive Branch, and advocate for a timely and just resolution. Over the course of the last four sessions of Congress, a message has been told, coalitions have been built, and allies have been recruited all in an effort to protect the simple enjoyment of a great cigar. You would think this would be an easy task. After all, it is about solitude and camaraderie among friends who are essentially enjoying a product that is a creation of nature - assembled by skilled artisan hands. However, as we all know there have been and always will be forces at work, whether it be the nanny state or political opposition wanting to interfere with not only your enjoyment of that cigar, but wanting to cause economic havoc on small businesses across America and instability throughout the cigar producing nations of Latin America. The tide, however, is turning. Through a concerted strategy with our industry allies we now have new opportunities to not only tell our story, but to obtain tangible relief from the bureaucratic malaise that plagues Washington, DC. It all essentially began on September 14, 2017, when for the first time the U.S. House of Representatives adopted budget language for a premium cigar exemption from burdensome regulations as proposed by the U.S. Food and Drug Administration (FDA). That moment, was the culmination of not only the current 143 Members of Congress that are supporters and sponsors of such language, but also the result of the over 289 existing and former Members of Congress that have helped carry that message. Then as we entered the new year, one of the most significant moments in the history of our fight, occurred on February 27, 2018, when Carlito Fuente, Jorge Padron, Robert Levin, and Rocky Patel representing Cigar Rights of America (CRA), and Greg Zimmerman of Pennsylvania and Craig Cass of North Carolina representing the International Premium Cigar and Pipe Retailers Association, made an unprecedented presentation to the new FDA Commissioner Dr. Scott Gottlieb and his staff, on the true nature of the premium cigar industry. In the presentation, these industry leaders explained why the current regulations are unfair, why they are overly burdensome, and why the FDA's entire approach far surpasses the congressional intent of the tobacco control act. To take our message to a national audience, on March 19, 2018, Rocky Patel, on behalf of Cigar Rights of America appeared on Tucker Carlson Tonight on Fox News Channel. In the course of just a little over five minutes, Patel was able to capture our arguments and plead for our relief a seven digit television audience, in a segment that now has over 312,000 online views. This appearance was a unique moment in the effort to protect the premium cigar industry. Clearly, the message from February 27th presentation on the impact of these regulations to the Trump Administration, did not fall on deaf ears. On March 23, 2018, consistent with a promise made by FDA Commissioner Gottlieb on July 28, 2017, FDA published what is known as an Advanced Notice of Proposed Rulemaking ("ANPRM") exclusively on the questions surrounding premium handmade cigars. This opportunity to tell our story, while not being placed in the mix with other tobacco products, is a moment to truly differentiate the uniqueness of premium handmade cigars from other tobacco products. And, while the various premium cigar trade associations are developing their technical comments to FDA, you too will have an opportunity to tell FDA why their approach needs to change. Within the same week of the ANPRM release, on March 28th, CRA and IPCPR joined yet again for a presentation to the Trump Administration. Bill Paley, owner of La Palina Cigars, and John Anderson, owner of W. Curtis Draper Tobacconist of Washington, DC, made a presentation to the White House Domestic Policy Council, which is charged with regulatory input on matters of national economic significance, and will play a key role in fulfilling the Trump Administration's highlighted commitment in the Unified Regulatory Agenda to address the premium cigar regulatory question. Despite the significant action in 2018 with the Executive Branch, Capitol Hill has still been a focus. Early this year, the House Freedom Caucus, as a coalition of "limited government representatives," included a regulatory exemption for premium cigars in their annual agenda...this is coupled with the decision by the Trump Administration, through the FDA, to grant a three-year reprieve from many of the burdensome substantial equivalence requirements for premium cigars. While it is easy for any of us to be concerned about the "ways of Washington," these days...especially with the very public dysfunction of congress and constant state of partisan bickering, we can at least look to these tangible steps of momentum that have been made possible by the recognition that the regulatory state has gone too far. We have said on numerous occasions, in this column, that this is a three-front war taking place at both ends of Pennsylvania Avenue, and a courthouse in between. But it is only through your voice, to your members of the House and Senate that this critical juncture has been made possible. For the first time in history, nearly a half million Cigar Voters have let their voices be heard through petition campaigns to Congress and two presidents. While we often understand the frustration with constantly having to reinforce this message to politicians that you may or may not believe to be listening, we can say beyond any doubt that your commitment to this process has made a difference. However, I am afraid we have to say, welcome to the new normal. Whether it is objecting to federal regulations of historic proportions, a statewide smoking ban that could destroy your favorite shops and lounges, or a tax proposal by your local city council, it is now more important than ever that you make your commitment as a cigar voter a permanent part of your enjoyment of a premium handmade cigar. The above is courtesy of CRA of which Milan Tobacconists is a member. To learn more about the CRA, please visit www.cigarrights.org. Last week, Congressman Bill Posey and 32 other members of the House of Representatives sent a letter urging the federal government to extend the premium cigar advance notice of proposed rulemaking (ANPRM) comment period. The comment period is currently slated to close on June 25th, and is the third of three tobacco and nicotine focused ANPRM's released by the FDA. The letter also asks for a simultaneous delay to the looming August 10, 2018, labeling deadline for packages and advertising. IPCPR, along with other associations representing the premium cigar industry have previously filed comments directly with the FDA requesting an extension of the ANPRM comment period. The association applauds the 33 Members of Congress for their continued support on behalf of the industry. Addressed to Mick Mulvaney, Director of the Office of Management and Budget, the letter once again highlights the deep-seeded concern within Congress over FDA regulations of premium cigar products. "As members of the U.S. Congress representing all sectors of the hand-rolled premium cigar industry, we remain concerned that the FDA's regulatory overreach on this issue, which is contrary to Congress' intent under the Family Smoking Prevention and Tobacco Control Act (FSPTCA), will continue to impose greater economic burdens on the manufacturers and retailers of premium cigars." The letter rightly points out that the time and resources needed to respond to the breadth and technical detail of data requested by the FDA exceeds the allotted time. According to Scott Pearce, IPCPR Executive Director, Congressman Posey's letter is indicative of the value retailers around the country hold on Capitol Hill. "It's heartening to know that because our IPCPR members have been such a vocal constituency to representatives in Congress, those representatives truly understand our issues and are now a vocal constituency to the Administration," said Pearce. "IPCPR is excited about once again proving our case against poorly designed and harmful regulations through the ANPRM process. Our association sincerely thanks the letter signatories for their support and effort to make sure we have the time necessary to respond." "Few things in life give me as much pleasure as handmade, premium cigars. They help organize my thoughts, they allow me to reflect and they relax me. As a reader of Cigar Aficionado, and a visitor to CigarAficionado.com, I bet you feel the same way. That's why I'm reaching out to you with a very important personal request. The U.S. Food and Drug Administration has enacted serious and onerous restrictions on the premium cigar industry. Some of these restrictions have already gone into effect-the ability to create new products, for example, is now shackled with prohibitions-and many more are scheduled to follow very soon. All of these restrictions threaten the very industry itself, and must be stopped. The FDA recently opened a comment period, inviting the public to weigh in on the issue. They have said they are willing to listen, so it's imperative that we all tell the FDA that premium cigars deserve exemption from these regulations. The FDA needs to know that premium cigars are not at all like cigarettes or machine-made cigars. They are made by hand, contain only natural products, and are smoked by adults. They don't need to be regulated. There aren't many companies that make them, and it's a small industry, with many family-owned companies crafting artisanal products in a manner that hasn't changed in decades. As an adult who chooses to enjoy premium cigars, I am writing to share my thoughts on the U.S. Food and Drug Administration's recent Advance Notice of Proposed Rulemaking that was published on March 26 of this year pertaining to premium cigars. It is my understanding that in order to assist in its evaluation of the regulation of premium cigars, FDA is seeking comments and other information that may have developed since the final rule was issued. As a premium cigar consumer, I have closely followed what FDA has done since it announced its Final Rule regarding premium cigars in 2016. I continue to believe that premium cigars are a unique product, very different from the cigarettes and smokeless tobacco that Congress actually instructed FDA to regulate. FDA's actions in regulating premium cigars demonstrate that the agency has attempted a "one size fits all" approach to regulation. But premium cigars do not present the health, addiction and youth access issues associated with other tobacco products. FDA should respect those differences, rather than lumping premium cigars into the same group as cigarettes and cheap, candy-flavored cigarette substitutes. A premium cigar is made by skilled artisans, using all-natural tobacco. It has no additives, using only aged tobacco, water and some vegetable gum. It doesn't have filters or tips, and comes in artistic and ornate packaging that shouldn't be marred by glaring warning labels. I agree that recent studies should lead FDA to reconsider its overreaching rules on premium cigars. Data from the 2013 National Adult Tobacco Survey, the 2013-2014 Population Assessment of Tobacco and Health study, and the National Longitudinal Mortality Study from 1973-2011, show that very few youths use premium cigars and that the typical premium cigar consumer faces no statistically significant elevated health risks. The findings have been confirmed in peer reviewed articles in the New England Journal of Medicine and Journal of the American Medical Association. This new and rigorous research alone should cause the agency to reevaluate the harshness of the final rule. No one said it better than the head of the FDA himself, Dr. Scott Gottlieb. In an April 2012 op-ed published before he became Commissioner, Dr. Gottlieb wrote, "Whatever the FDA does, the fight [to regulate cigars] reveals a broader trend of expanding the scope of regulation to cover areas never envisioned by Congress." Dr. Gottlieb noted the agency does not have to regulate premium cigars simply because they contain tobacco: "The agency could argue that the premium cigars fall within its jurisdiction as a "tobacco product" but that, for now, it will exercise discretion and not regulate the high end smokes." The above blog post is courtesy of Marvin Shanken, Editor In Chief And Publisher of Cigar Aficionado, and shared with permission by CRA of which Milan Tobacconists is a member. To learn more about the CRA, please visit www.cigarrights.org. Today, the International Premium Cigar & Pipe Retailers Association (IPCPR), Cigar Association of America (CAA), and Cigar Rights of America (CRA) were pleased to announce the adoption of language in the FY 2019 budget as approved by the U.S. House of Representatives Committee on Appropriations by a vote of 29 - 20 that works to protect premium cigars from overreaching and burdensome regulations, as proposed by the U.S. Food & Drug Administration. The language addresses significant concerns that the premium cigar industry has maintained since the rule was proposed in 2014. According to Scott Pearce, IPCPR Executive Director, this language is proof positive these concerns are not only heard, but validated. "I think we've seen broad recognition on and off Capitol Hill that FDA's regulatory regime for premium cigars has been deeply flawed since it was introduced four years ago," said Pearce. "IPCPR and CRA applaud Congressmen Cole, Bishop and all of our supporters on Capitol Hill for finding a sensible legislative solution that provides premium tobacconists and manufacturers certainty. Congress never intended for the premium industry to endure the regulatory burdens imposed by the FDA. Today's vote reinforces that." CAA President Craig Williamson extended his thanks to the Committee for adopting the amendment. Williamson added, "after working on two separate amendments for the past four years the groups realized that we are stronger working together to accomplish the same goal - the protection of the entire cigar industry." CRA Executive Director Glynn Loope stated, "This amendment once again sends a clear message that the regulations advanced by the FDA go well beyond the congressional intent of the Tobacco Control Act. We extend our appreciation to our legislative co-sponsors that have served as champions for this language, as well as proponents of regulatory reform as it applies to cigars with the President's Administration." The language as adopted by the committee blends past efforts, by not only providing an exemption for defined premium and large cigars, but changing the "predicate date" for cigars and pipe tobacco from burdensome pre-market approval procedures to the time of the deeming rule issuance, from February 15, 2007 to April 25, 2014. The above statement is courtesy of CRA of which Milan Tobacconists is a member. To learn more about the CRA, please visit www.cigarrights.org. U.S. District Court Judge Amit P. Mehta ruled in favor of the U.S. Food and Drug Administration (FDA) on most counts in the joint lawsuit filed by the Cigar Association of America (CAA), Cigar Rights of America (CRA) and the International Premium Cigar & Pipe Retailers' Association (IPCPR) in July 2016. The group then filed for a motion of partial summary judgment in October, asking the court to stop FDA's implementation of warning labels, user fees, and various pipe tobacco restrictions. Mehta went on to note, "The court's displeasure with the FDA's handling of the status of premium cigars, no doubt, provides little consolation to the industry. But the court can do no more. Its hands are tied by both the law and the posture of the case." The one piece of good news for retailers like us who blend our own pipe tobacco in the shop is the judge found that the FDA wrongly interpreted Congressional intent with the law and ruled against treating retailers like manufacturers. It would have been a monetary burden few tobacconists who still blend their own tobacco could have born. The CAA/CRA/IPCPR group and the FDA will return to court on June 11, 2018, to discuss the status of the case. The group has indicated it may appeal. With the issuance of the most recent congressional omnibus budget bill to fund the federal government for fiscal year 2018, it was learned that the legislation did not include language to better protect the premium cigar industry from unwarranted and onerous federal regulations. Since April 15, 2011, for the first time in history, the premium handmade cigar industry has joined forces with allies such as the International Premium Cigar & Pipe Retailers Association to advance language that defines a premium cigar, and work toward regulatory relief from the threats presented by the U.S. Food & Drug Administration. Cigar Rights of America Executive Director J. Glynn Loope stated, "Despite not being in this most recent budget package, it is important to remember that this is a long term fight to protect this skilled artisan pursuit of making, selling and enjoying premium handmade cigars. Since April 2011, over 280 members of the U.S. House of Representatives and twenty-six members of the U.S. Senate have said 'yes' to such a proposition, and over seventy of those voted for the original Tobacco Control Act. This has worked to make the case that the premium cigar industry is an unintended consequence of the original act, and that these regulations go well beyond congressional intent." Loope continued, "That has led to the current coalition in the 115th session of congress where 143 bipartisan members of the House and twenty members of the Senate have echoed that message. The most important consideration here is that the legislation has, and for the rest of this session of congress will serve as the sounding board for our message to the President's Administration that our cause is perfect for their regulatory reform agenda. We have numerous opportunities from this point forward. The forthcoming Advance Notice of Proposed Rule Making by the FDA will be a unique opportunity to focus on the premium cigar issues that were clouded in the first round of the regulatory process. In addition, we will be focused on our message with the executive branch, and having our allies in congress join us in working toward protection of the premium cigar industry. This battle spans both ends of Pennsylvania Avenue, and this legislation has developed a record for a coalition of Representatives and Senators that will assist well into the future. This all while we work with our industry allies on the litigation against these unwarranted regulations." 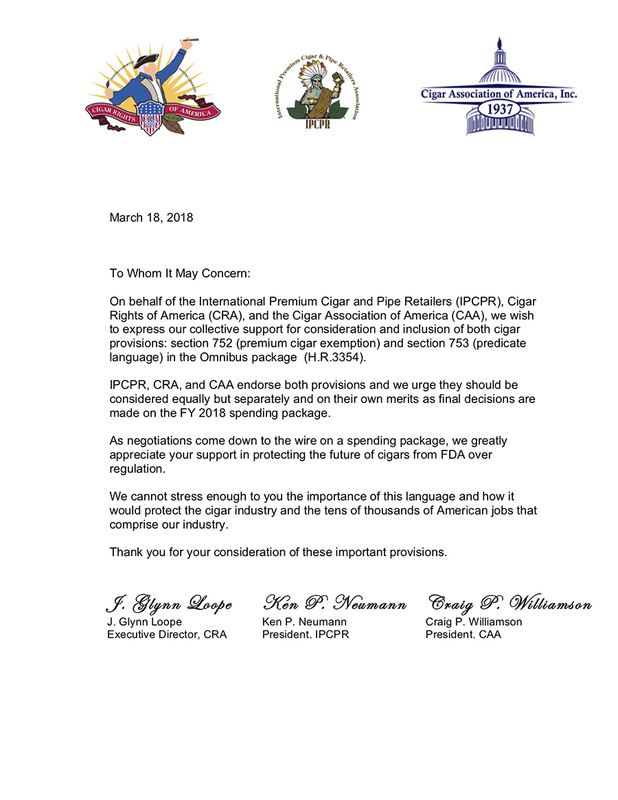 On March 18, 2018, Cigar Rights of America (CRA), the International Premium Cigar and Pipe Retailers Association (IPCPR), and Cigar Association of America (CAA) asked Congress in an open letter to include language in the upcoming omnibus funding bill that would ease the regulatory burden on the cigar industry by the U.S. Food & Drug Administration (FDA). Please click here to view the letter. The above information and Action Alert link are courtesy of CRA of which Milan Tobacconists is a member. To learn more about the CRA, please visit www.cigarrights.org. FDA's application of user fees. Arguing on behalf of the premium cigar industry was Michael Edney, Partner at Norton Rose Fullbright LLP. He was assisted by co-counsel, Mark Raffman, a Partner at Goodwin Procter. IPCPR couldn't be prouder of our representation before Judge Mehta and the efficacy of arguments made by our counsel. This was a major step in IPCPR's ongoing efforts to combat the FDA's shortsighted and overbearing regulations, and just one of several pathways our association has undertaken to find a remedy. "From the very beginning we knew this was going to be a long and tough road, and last Thursday's hearing shows just how far we've come as an industry" argued Ken P. Neumann, IPCPR President. "This isn't the end by any means and now we need to wait on the judge to hopefully find in our favor, but nothing is guaranteed. However, with our litigation team and all the hard work undertaken by our association and industry, I think we at least finally have a fair fight." A ruling from Judge Mehta is unlikely before the new year. IPCPR will continue to keep our members informed of any developments in the ongoing legal, legislative and regulatory campaigns and look forward to more positive developments in 2018. The above Action Alert link is courtesy of CRA of which Milan Tobacconists is a member. To learn more about the CRA, please visit www.cigarrights.org. From the International Premium Cigar & Pipe Retailers Association (IPCPR) ~ Earlier this week, 29 Members of Congress sent a letter to Mick Mulvaney, Director of the Office of Management and Budget (OMB), urging him to exercise oversight of regulations affecting premium cigars. The letter, led by Congressman Dennis Ross (FL-15), requests Director Mulvaney "to consider an immediate extension of current regulatory deadlines that are burdening premium cigars and an ultimate exclusion for premium cigars from FDA oversight." It also praises the Food and Drug Administration's (FDA) issue of an Advanced Notice of Proposed Rule Making (ANPRM) on premium cigars and stresses ongoing Congressional support for regulations that effectively impact and advance the public health. IPCPR applauds the efforts of Congressman Ross and the letter's co-signors to stop the devastating impact current regulations have on the industry. Our association, along with our industry partners, appreciate the continued support from Capitol Hill. Today, the United States House of Representatives passed the Make America Secure and Prosperous Appropriations Act of 2018, H.R. 3354. By a vote of 211-198, the House adopted language that would exempt premium cigars from FDA language by restricting the Food and Drug Administration (FDA) from using any funds to enforce the rule. The specific language included in the bill, is the same language that was adopted by the full House Committee on Appropriations on July 12th of this year. J. Glynn Loope, Executive Director of Cigar Rights of America (CRA), stated "that passage of this amendment, as included in the Make America Secure and Prosperous Appropriations Act of 2018, is a testament to the bi-partisan coalition of co-sponsors that have served as a voice of reason, that premium handmade cigars do not deserve the treatment of draconian regulations as proposed by the FDA. Loope continued, " the bill further speaks to the original congressional intent of the Tobacco Control Act, while serving as a message to the U.S. Senate, as budget negotiations continue this year." CRA would like to publicly commend the House of Representatives for taking action to protect the small business premium cigar manufacturers and retailers of this country as well as protecting the rights of adult consumers of premium cigars. CRA looks forward to working with our supporters and champions in the Senate as they began the process of consideration of this bill. CRA is working in partnership with the International Premium Cigar and Pipe Retailers Association in an effort to seek this premium cigar exemption, and to mitigate the detrimental impact of the currently proposed FDA regulations. Courtesy of CRA of which Milan Tobacconists is a member. To learn more about the CRA, please visit www.cigarrights.org. In a joint press release, Cigar Rights of America (CRA) and the International Premium Cigar and Pipe Retailers Association (IPCPR) shared that Commissioner of the U.S. Food & Drug Administration Dr. Scott Gottlieb announced a new comprehensive plan today for the approach the agency will take with the regulation of tobacco products, placing an emphasis on a science-based method noting a "continuum of risk" that recognizes the differences in tobacco products. Importantly, Dr. Gottlieb stated that the FDA will reexamine the treatment of premium cigars under the agency's current regulatory structure. Ultimately, the agency will open a new rule-making process to engage with the industry to better understand premium cigars, specifically. As representatives of the premium cigar industry, both the CRA and IPCPR are encouraged by the FDA's renewed and objective approach to the industry and welcome the opportunity to again demonstrate the skilled artisan nature of premium cigars and how they are truly distinctive at all levels. For premium cigar manufacturers and retailers, today's announcement provides some clarity on the path forward. Of note, CRA and IPCPR applaud the decision to provide targeted relief to some pending deadlines dictated in the 2016 final rule. This includes revising the pre-market application deadline to August 8, 2021. Moreover, under today's guidelines tobacco products with pre-market applications submitted to the FDA can stay on the market for the duration of the application review process. In addition to changes announced today, CRA and IPCPR are awaiting further information from the FDA regarding other key future compliance deadlines. Importantly, compliance requirements that have already gone into force will remain in effect for manufacturers and retailers alike. CRA, IPCPR, and other industry partners look forward to working with the FDA as it implements the approach announced today. CRA Exective Director Glynn Loope and IPCPR CEO Mark Pursell stated upon FDA's announcement, "This has been a long and complicated process, which is not over. However, we commend the objective approach announced today by the Commissioner of the FDA. This revisiting of the rule is testament to the recognition that you cannot regulate all products in the same manner. We would like to thank our bipartisan coalition of congressional allies that have assisted in reinforcing that message to the administration, as we begin the next steps in this process." Courtesy of the CRA and IPCPR of which Milan Tobacconists is a member. To learn more about the CRA, please visit www.cigarrights.org and visit www.ipcpr.org to learn more about the IPCPR. In a press release, Cigar Rights of America (CRA) announced the U.S. House of Representatives Committee on Appropriations debated the Fiscal Year 2018 Agriculture Appropriations Bill ("FY 18") and, by a voice vote, the full Committee passed a bi-partisan bill that included language to protect premium cigars from proposed FDA regulation. CRA applauded the passage of the bill and the inclusion of the language protecting premium cigars from unwarranted regulation by FDA and went on to thank both Appropriations Committee Chairman Rodney Frelinghuysen (R-NJ) and Agriculture Subcommittee Chairman Robert Aderholt (R-AL), as well as members of the Appropriations Committee for their leadership in addressing this issue, and for protecting the small business premium cigar manufacturers and retailers of this country and the rights of adult consumers of premium cigars. J. Glynn Loope, Executive Director of CRA, stated upon the bill's passage, "The action taken today by the House Committee on Appropriations for a second consecutive year is yet again another clear and definitive statement that Congress never intended for premium cigars to be treated like other tobacco products." Loope continued, "Congress continues to recognize the unique differences between premium cigars, and this language is a symbol that any effort by FDA to regulate them would run contrary to the intent of Congress." CRA commended the organization's working partnership with the International Premium Cigar & Pipe Retailers Association to advance this essential language calling for exemption from federal oversight of the premium cigar industry. From Cigar Rights of America ~ Since July 15, 2016, Cigar Association of America (CAA), Cigar Rights of America (CRA), and the International Premium Cigar and Pipe Retailers Association (IPCPR) have been pursuing litigation in federal court against the United States Food and Drug Administration (FDA), challenging the FDA's May 10, 2016 Rule deeming cigars and pipe tobacco to be tobacco products subject to FDA regulation. In the context of the litigation, the FDA has announced an extension of upcoming compliance deadlines under the deeming rule. Specifically, on May 1, 2017, the United States Department of Justice advised the United States District Court for the District of Columbia that the FDA will extend and defer enforcement of all future compliance deadlines under the Rule for three months, and that it plans to issue guidance to that effect. The United States Department of Justice informed the court that new leadership at the United States Department of Health and Human Services wish additional time to more fully consider the issues raised in the Rule. For example, the deadline for submission of product listings, previously June 30, 2017, will now be September 30, 2017. The three month extension applies to all future scheduled deadlines whether they fall in 2017, 2018, or later. IPCPR Chief Executive Officer Mark Pursell stated, "This is certainly good news for our retail and manufacturing community, given the nature of the rules the industry is facing, and the uncertainty they create. This gives everyone, the industry and the administration alike, time to revisit the regulation, to determine the best path forward." Cigar Rights of America Executive Director Glynn Loope added, "This extension speaks to the questions raised in the suit, and the recognized need by the new administration to review the nature and impact of the proposed regulations. It also speaks to the virtue of our multi-front strategy to mitigate the threat of these regulations. It spans both ends of Pennsylvania Avenue, and a courthouse in between." The associations will collaborate on conveying additional information to the industry as it becomes available. A notice is expected to be published in the coming days further memorializing FDA's extension of compliance deadlines under the Rule. Courtesy of Cigar Rights of America (CRA) of which Milan Tobacconists is a member. To learn more about the CRA, please visit www.cigarrights.org. From the International Premium Cigar & Pipe Retailers Association (IPCPR) ~ Earlier this week two separate amicus briefs were filed in support of the ongoing legal challenge by the IPCPR, Cigar Rights of America (CRA), and Cigar Association of America (CAA) to the recently implemented FDA deeming regulation. The Amicus Curiae, or "Friend of the Court," briefs are a process for non-involved parties to submit testimony, facts, and opinions that the court may not have access to during its normal proceedings. The first brief, filed by the State Attorneys General of Arizona, Louisiana, Michigan, and Texas agreed with the crux of the lawsuit that FDA's final rule regulating premium cigar products is ultimately illegal. Concurrently, an additional brief was filed by Cause of Action (COA) Institute, a non-profit organization dedicated to pursuing and defending personal liberty. Both briefs rightly point out the many shortcomings, fallacies and damaging elements included in and precipitated by the FDA's final rule, including 1) the clear lack of understanding of the economic fall out for small businesses, 2) a mitigation of the tax base used to fund state anti-smoking activities, and 3) an artificial definition of the marketplace by government regulation. IPCPR applauds these efforts by the Attorneys General and the COA - and thanks them for their support of premium cigar retailers, consumers, and manufacturers everywhere. We look forward to continuing our fight on behalf of small businesses and the premium cigar industry. Yesterday, in the U.S. District Court for the District of Columbia, the Cigar Association of America (CAA), the International Premium Cigar & Pipe Retailers Association (IPCPR) and Cigar Rights of America (CRA) filed a Motion for Summary Judgment and opening brief in the cigar industry's litigation challenging the FDA's Final Deeming Rule. This filing serves as the next phase in the premium cigar industry's joint litigation challenging FDA's Final Deeming Rule, which began in July 2016 with the Cigar Association of America, et al. v. Food and Drug Administration, et al. lawsuit in the same court. In filing the summary motion, the three industry associations are petitioning the court to vacate and set aside the Deeming Rule because it is unlawful and in violation of the Administrative Procedures Act as well as the First and Fifth Amendments to the Constitution. Speaking about the filing, Glynn Loope, Executive Director of Cigar Rights of America said, "The premium cigar industry continues its adamant objection to the Deeming Rule and its defective implementation. This process has resulted in premium hand-made cigars being subjected to requirements that will cause irreparable economic harm to this artisan industry, and the Main Street America small businesses that rely upon it. We trust that the merits of our argument will demonstrate to the court that the Deeming Rule is fundamentally flawed and legally deficient." The trial on the joint industry lawsuit is schedule to be held on July 28, 2017. UPDATE: The trial previously scheduled to be held on July 28, 2017, has been delayed. The U.S. District Court for the District of Columbia granted the U.S Justice Department's request to push back the court date and has set the start of the trial for August 30, 2017. If you are interested in learning about current smoking-related legislation in your state, we suggest visiting the International Premium Cigars and Pipe Retailers Association (IPCPR) legislation webpage -> www.ipcpr.org/legislation.html.